The mud is long gone. 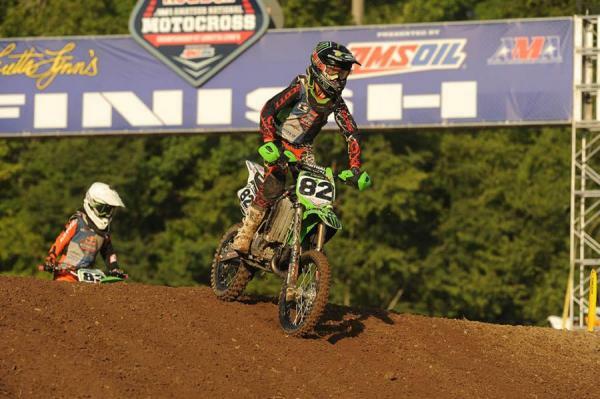 The sun was out today, and it shined a little more brightly on a few young stars at Loretta Lynn’s Ranch. On a Friday, the first sets of champions were crowned in the 32nd annual running of the Red Bull AMA Amateur National Championships presented by Amsoil. We might have a rivalry to watch in the future, as Kawasaki’s Garrett Marchbanks and KTM’s Jalek Swoll battled to a standstill in the 85 (9-11) classes. Each took a title, with Swoll winning the Limited class with 2-1-2 scores when Marchbanks had a bad first moto with a fifth. But in the Mod class, they entered the final moto in a winner take all shootout, and Marchbanks performed under pressure to take the moto win and the title. It could be fun to watch these two battle in the future, but Marchbanks is already a fairly big kid, and might not last on minis for long. Garrett Marchbanks scored a title today. 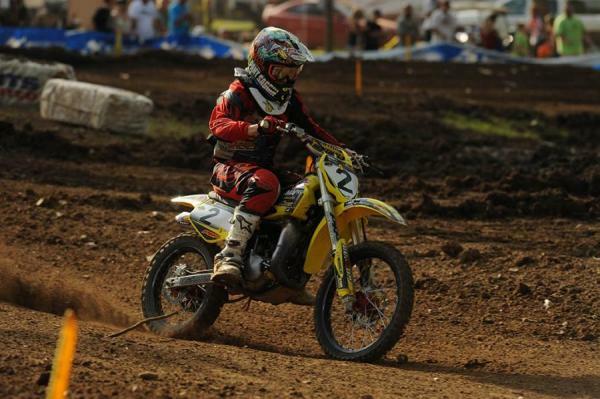 Mitchell Harrison won a Supermini Crown. A step ahead comes the Mini Sr. class, where Joey Crown, one of the few riders in the class on the Honda CRF150, took the title. Then there was history made in the 65cc and 50cc classes. Jett Reynolds (pictured at top) won a title in each class, the first time since 1997 that a rider has won on a 50 and a 65 in the same year. The last rider to do that? None other than Davi Millsaps. That’s some amazing company, and a check of our Loretta Lynn’s Vault shows Millsaps went 1-1-1-1-1-3 back then, while Reynolds just got the clean sweep in all of his motos this time. Perhaps the most dramatic battle came in 65 (10-11) Limited. Aiden Tijero and Ty Masterpool were dueling for the title coming in, and Tijero got a miserable start and was back in 14th. Masterpool wasn’t much better, and they marched toward the front of the pack. Tijero logged an incredible run late, getting Masterpool with two laps to go, and then race leader Jace Kessler on the final lap to steal the lead, the win and the title. Masterpool has his chance for revenge tomorrow in the 65 (10-11) Mod final, where he has a two-point lead over Tijero. On big bikes, Aaron Plessinger’s incredible week continues. He’s now 1-1 in the 250 B class thanks to a strong second moto, where Jordan Smith, generally considered the hottest B prospect in the country, made the pass on him only to stall. Plessinger took over from there. Then AP delivered a 1-1-1 sweep in 450 B, his first title at the Ranch. In tomorrow’s live moto on NBC, Plessinger will try to finish it off with another title in that 250 B class. Matt Bisceglia handled Open Pro Sport. Can he deliver in 250 A tomorrow during the live NBC broadcast? And 250 A will be a showdown live on NBC tomorrow, too, with Shane McElrath taking a moto win from Matt Bisceglia in a great battle today. They are now tied, 1-2 and 2-1 going into the third and final moto. In that race, Jace Owen looked to have an upset in the making, as he had McElrath and Bisceglia seemingly covered while leading. Then Owen cased a triple in the Ten Commandments super hard, smashed his face on the bars, and pulled off to the side of the track. McElrath then held on to win, barely, with Bisceglia all over him at the finish. 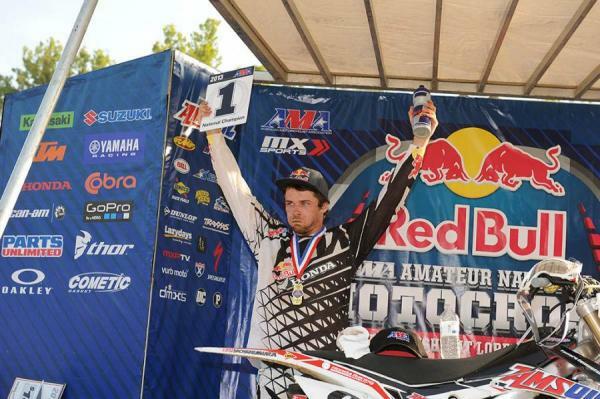 Bisceglia already delivered one title today, topping McElrath in Open Pro Sport already.